This brand new building is located just 500 metres from the centre of Naxos Town and only 30 metres from the popular, sandy Saint George Beach. 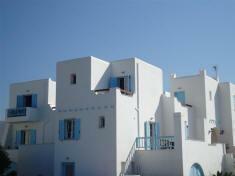 In operation since August 2004 this accommodation is ideal for lovers of the sea. You have the opportunity to enjoy a great variety of water sports, such as wind surfing, kite surfing and jet skiing. Whatever the occasion of your visit, you can enjoy rooms and studios with balconies or verandas which offer views towards the sea and the highest mountain on the island, Mount Zas. Pets Allowed, Bar, Garden, Continental Breakfast, Family Rooms, Free Parking, Luggage Storage. Room Service, Airport Shuttle, Laundry, Dry Cleaning, Internet Services, Currency Exchange, Bicycle Rent, Car Rental, Fax/Photocopying, Ticket Service, Free Wi-Fi Internet Access Included.